August 27, 2015, 6:51 a.m. There has been a lot of confusion about where exactly Jeremy Corbyn’s support is coming from. Depending on which newspaper you read, his supporters are depicted as one of old-fashioned socialists following union orders, affluent Islington drawing-room liberals, excitable young social media types, or even Tories in disguise. In order to help cast some light on what is really driving the Corbyn phenomenon, we’ve taken a look at YouGov’s detailed profile data of a group of 3,735 eligible voters in the Labour leadership election. We’ve broken it down to see if we can unpick what holds Corbyn’s supporters together as a group – and what distinguishes them from supporters of his rivals. The first thing to remember is that the relatively few people eligible to vote in the Labour leadership election – 400,000 odd until a few weeks ago, now more like 600,000 – are not remotely representative of the rest of the country. In most respects, there is more that unites the supporters of the four candidates than divides them: as a group they are much more political, more left wing and more partisan than the country at large. Our sampling for the different supporter groups took place in the first week of August, about a week before registration closed and the ballot papers went out. We know from the Labour Party that as many as 200,000 additional members joined in that final week, around half last-minute union sign-ups and the other half divided between new £3 members and new full members. We don&apos;t have data on the makeup of these latest groups, but there is no evidence that they follow a different pattern to the pre-existing majority - and any individual tranche would have to be wildly different in order to affect the larger picture. When you start looking into the demographics of the supporters of the four leaders, clear differences start to emerge. 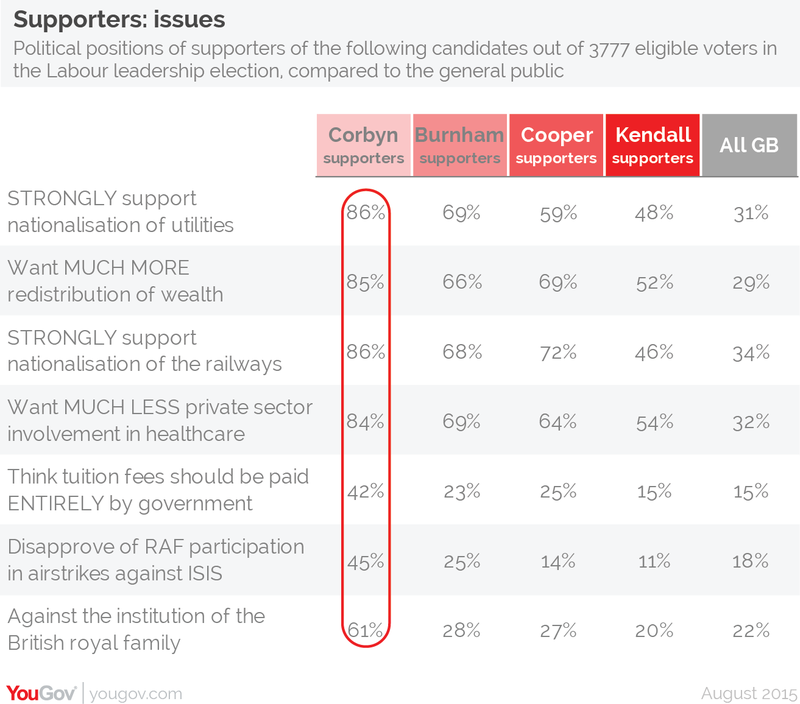 In terms of income and social grade, the order is Kendall > Cooper > Burnham > Corbyn from higher up to lower down the scale; and in terms of how active they are on social media, Corbyn’s supporters are far ahead of the other three candidates. Interestingly, a supporter of Corbyn is almost twice as likely to have voted Liberal Democrat in 2010 as supporters of the other candidates. The combination of factors suggests that Corbyn supporters comprise a coalition of traditional &apos;old Labour&apos; members and a more mobile protest vote. 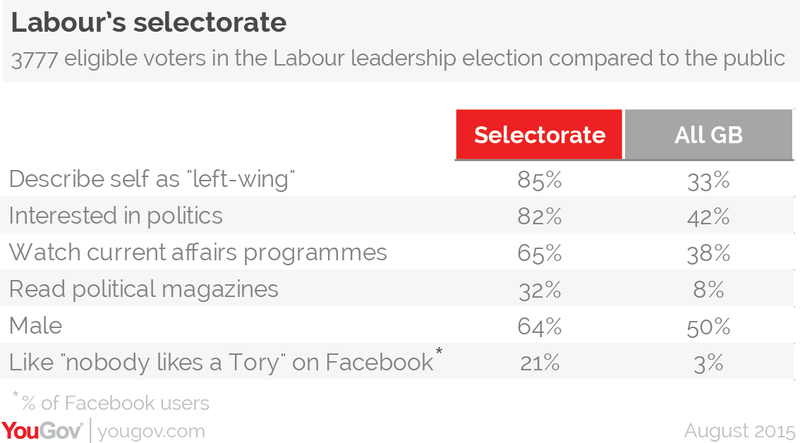 Politically speaking, the distinction is more clear cut: compared to the other candidates Jeremy Corbyn’s supporters are much more likely to see themselves as actively ‘left wing’ rather than simply ‘left of centre’. Corbyn supporters take a much more unanimous line on issues concerning the size of the state such as nationalisation of the railways and healthcare. In many cases, majorities of the other candidates&apos; supporters also support the same policy positions but express them with less conviction and are less uncompromising in how they would like them to be implemented. Most of Jeremy Corbyn’s supporters (51%) agree with the statement that “the United States is the greatest single threat to world peace”, compared to just 36% of Andy Burnham’s supporters, 18% of Yvette Cooper’s supporters and 15% of Liz Kendall’s. The continuing influence of the Iraq War as an issue is palpable in these numbers. 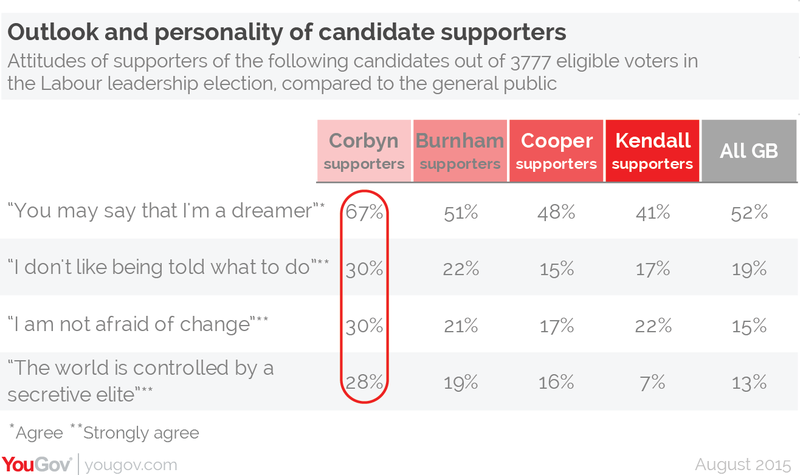 Each of those four general life attitudes is significantly more likely to be found among Corbyn supporters than supporters of the other three candidates. 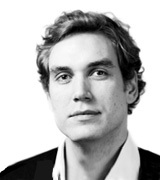 At first, the loose positivity of being a ‘dreamer’ seems to clash with the almost militant-sounding statements that the ‘world is controlled by a secretive elite’ and ‘I don’t like being told what to do.’ But in the context of a perceived political elite who have defined a permissible ‘centre ground’ and who reject as extremist any ideas outside it, it makes perfect sense. It&apos;s not necessarily about specific policies - they are intuitively more attracted to non-conformist alternatives and Jeremy Corbyn appeals to their broader world view. 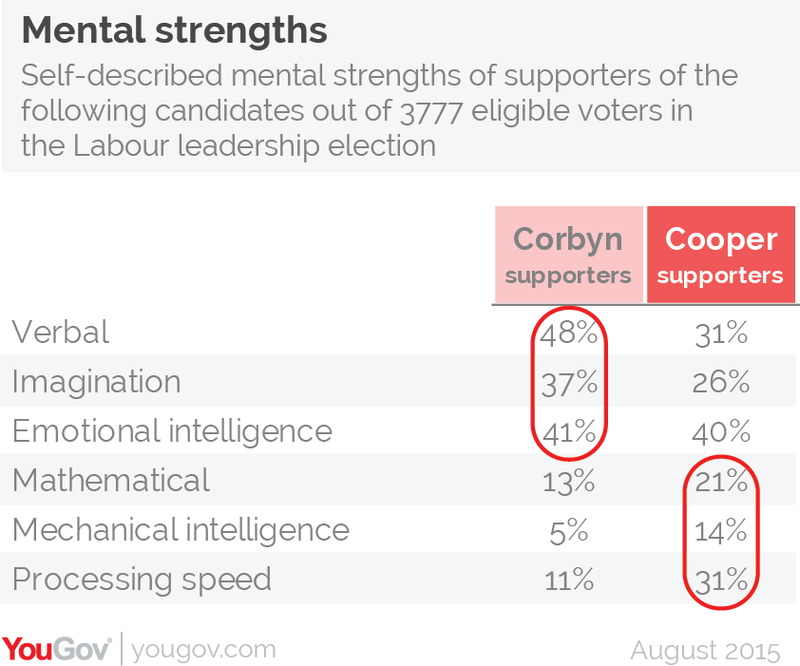 What’s more, when asked to identify their own strengths and weaknesses, Corbyn supporters self-identify as much stronger in verbal intelligence and imagination than for example Yvette Cooper’s supporters, who score themselves higher than average on mathematical intelligence and processing speed. Put simply, this group is not going to be ‘reasoned with’ - they are looking to be inspired. Elections are always about change, and this is a group who are particularly keen for something different. The fact Jeremy Corbyn has been so dismissed by the establishment has helped him to acquire the enviable mantle of the ‘change candidate’. In specific policy terms, it is true that Corbynites are on the fringe rather than the mainstream; but in terms of mood and personality, they represent a longing for an alternative that has an appeal far beyond the Left of the Labour Party. NOTE: Our sampling for the different supporter groups took place in the first week of August, about a week before registration closed and the ballot papers went out. We know from the Labour Party that as many as 200,000 additional members joined in that final week, around half last-minute union sign-ups and the other half divided between new £3 members and new full members. We don&apos;t have data on the makeup of these latest groups, but any individual tranche would have to be wildly different from in order to affect the overall picture.